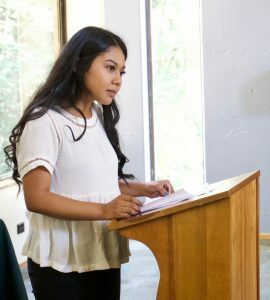 Over the last weekend, the Linguistics Department at UCSC hosted its annual Linguistics at Santa Cruz (LASC) conference, where prospective and current students, faculty, and alumni saw presentations from second- and third-year graduate students and alumna Louise McNally. The student presentations showcased in-progress research and drew insightful comments and questions from the audience. Jérémie Beauchamp kicked off the event with “Alternations in epenthetic vowel quality in Kĩsêdjê,” a thorough analysis of factors conditioning default and echo epenthesis in Kĩsêdjê. 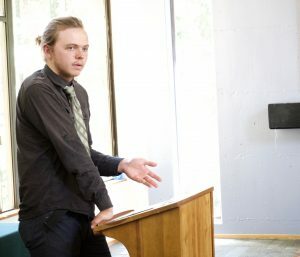 Ben Eischens presented “A puzzle of ko-occurrence: negative licensing in San Martín Peras Mixtec,” an investigation of the licensing conditions on various negative words in San Martín Peras Mixtec. 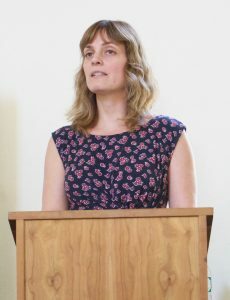 Lisa Hofmann discussed “Sentential negativity and polarity-sensitive anaphora,” a hyperintensional semantic analysis that accounts for the anaphoric character of sentential negation. Andrew Hedding walked through “New information and the grammar of focus: evidence from San Martín Peras Mixtec,” a study of the tonal marking of focus in San Martín Peras Mixtec and its implications for theories of focus. Japanese trimoraic nouns,” analyzed changes in pitch-accent patterns from older varieties of Japanese to currently spoken varieties. Netta Ben-Meir presented on “Epenthesis in Lebanese Arabic: a case of opacity revisited.” Her project contrasted two similar processes of vowel epenthesis in Lebanese Arabic, proposing that they occur at different levels of the grammar. 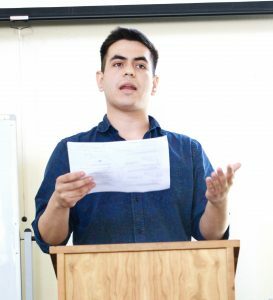 Richard Bibbs’ work, “Perceptual factors license phonological contrasts in Chamorro,” examined the surprisingly common occurrence of mid vowels before laryngeal consonants in Chamorro. Nick Van Handel discussed “The Italian syntax-prosody interface in Match Theory,” a unification of two previously unconnected prosodic processes in Italian through Match Theory. The final speaker of the day was invited alumna Louise McNally, whose presentation “Multi-level semantics for categorization and reference” proposed different levels of representation for various semantic processes. The reception following the presentations was marked by joviality, rainbows on Monterey Bay, and many smiling faces. Thank you to all of the faculty, staff, and students who helped to make this year’s LASC a success! 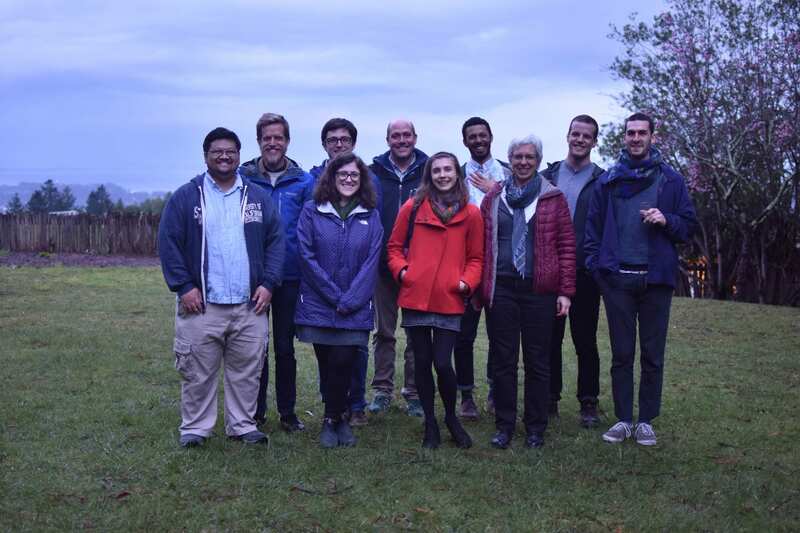 Pictured from left to right: Andrew Angeles, Andrew Hedding, Nick Van Handel, Netta Ben-Meir, Grant McGuire, Lisa Hofmann, Richard Bibbs, Louise McNally, Ben Eischens, and Jérémie Beauchamp. 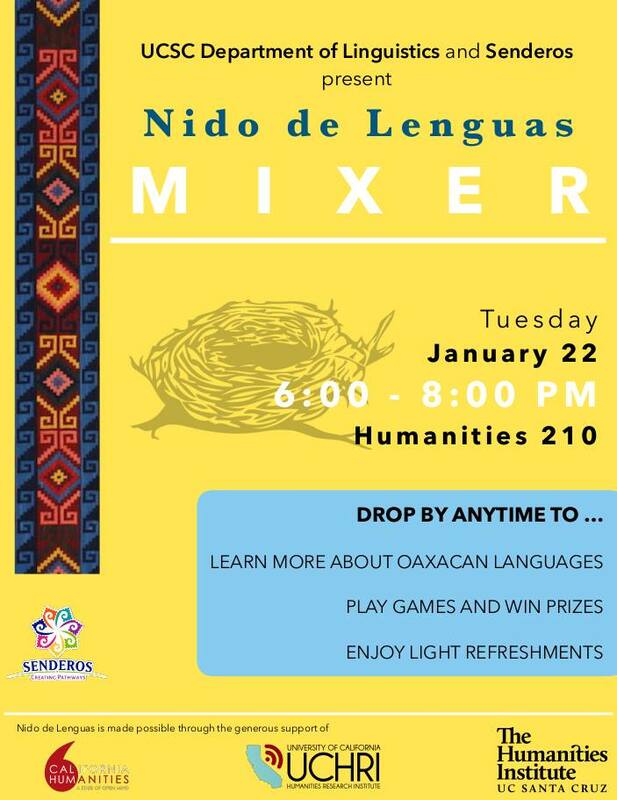 This Tuesday, January 22nd, Nido de Lenguas will host a gathering for the UCSC community from 6:00-8:00 PM in Humanities 210. 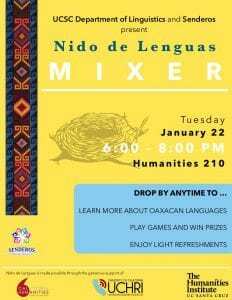 Come by to enjoy free food, learn about the mission and work of Nido de Lenguas, and find out how you can get involved! Thanks to everyone who participated in this year’s Linguistics Undergraduate Research Conference (LURC) on Friday, June 8. 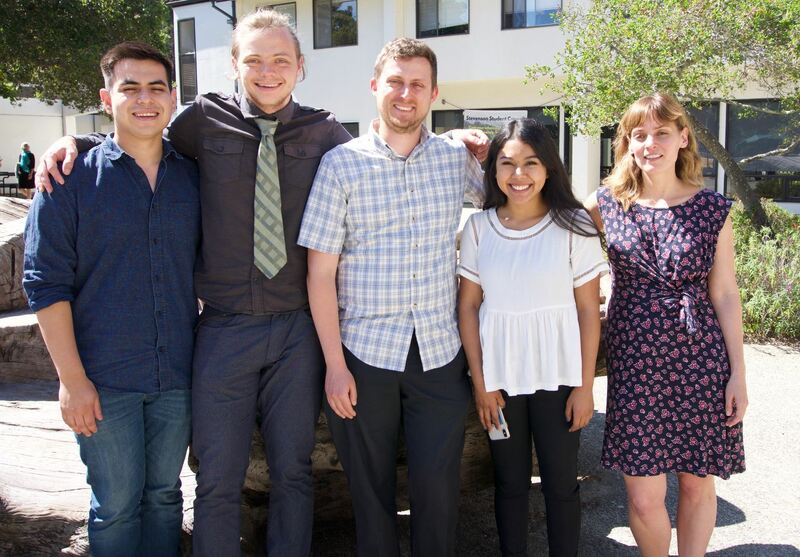 Three undergraduates in Linguistics and Language studies — Alejandro Garcia, Kevin Sanders, and Emily Martinez-Figueroa — presented original research dealing with topics in ellipsis, movement, focus, comparatives, reduplication, and prosody. The conference was capped off with a lovely presentation by UCSC undergraduate alumna Meredith Landman, entitled “The pragmatics of the sentence-final particle o in Yoruba”. Congratulations to our student presenters for a job well-done! Thanks also to Hitomi Hirayama, who provided photo coverage of the event. Some highlights are included below. Deniz Rudin will be defending his dissertation at 11:00am on Friday, June 1st, in HUM 1 Room 210. 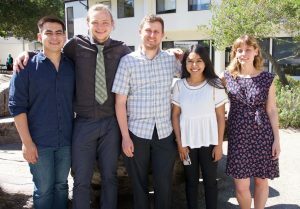 Deniz’s dissertation is titled “A Tale of Two Contours.” The committee consists of Pranav Anand (chair), Donka Farkas, Adrian Brasoveanu, Cleo Condoravdi (Stanford), and Dan Lassiter (Stanford).